Everybody has a list of kitchen staples they don't want to live without. Here's my list of staples to keep in the freezer. You can also share your own list. Homemade broth is ideal for soups. If you freeze it in ice cube trays you can pop out one cube at a time to saute veggies or add flavor to a sauce. And next time someone feels under the weather you've got a nourishing homemade broth right at your fingertips. 2) Cooked Chicken Slices are ideal to toss on a homemade pizza, salad or pasta dish with just a few minutes in the microwave instead of waiting for chicken breasts to bake or boil. You can also cube them up for a creamy chicken salad or dice them for a chicken stuffed pasta dish. 3) Cooked Ground Beef can be tossed into a sauce and served with pasta or mixed with taco seasoning for quick tacos or burritos. It's ready to be assembled in a casserole, dropped into a soup, seasoned for sloppy joes or mixed with beans for chili. 4) Cooked Rice is a huge time saver. Brown rice is nutty and nutritious but can take up to 45 minutes to cook. Frozen rice can be reheated in minutes to serve as a healthy side dish or use as a ingredient in another recipe. 5) Vegetable Skins and Scraps around my house always go in the freezer. Carrot peel, onion skin, the celery base and similar scraps go in a plastic bag in the freezer. Then whenever I want to make stock I dump the whole bag in a pan, fill with water and simmer away. No shopping, no prep, no mess. 6)Nuts add a nice crunch to salads, vegetable side dishes and desserts but they can go rancid fast. Storing them in the freezer helps keep them longer. 7) Bread, the staff of life, is such a daily staple that running out often means a trip to the grocery store. If you always keep a few loaves in the freezer you'll never run out again. Frozen sliced bread can be toasted without thawing. If you want a regular sandwich the slices thaw in minutes on the countertop. 8) Frozen Fruit is perfect for smoothies and desserts. Use frozen fruit instead of fresh fruit and you don't have to add ice to your smoothie. Heat your favorite fruit in a pan with some honey or sugar and use an immersion blender and you've got a great topping for ice cream, cheesecake or angel food cake. 9) Meatballs can be made into a million other meals. 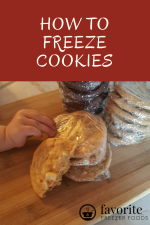 They are small so it's easy to grab just as many as you need and they thaw and reheat fast. Serve meatballs in sub sandwiches, on pasta, in soup, in sauce as an appetizer or on a pizza. 10) A bag of ice cubes. Not a tray of ice but a freezer bag with ice cubes in it. If the freezer gets too warm the ice cubes will melt and then when it gets cold again they will freeze together. This might seem trivial but it's how I can tell if there has been a power out for some reason and food has thawed and refrozen. 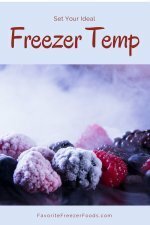 Refreezing food can decrease quality and safety thus it's important to keep track of. What staples do you depend on and always keep in your freezer? Two things that get me through the winter. Return from 10 Thing You Should Always Keep in Your Freezer to the homepage of Favorite Freezer Foods.